The Slide Lock Safety is located on the left rear of the pistol just below the slide. With hammer fully cocked and Slide Lock Safety applied, upper part of Slide Lock Safety engages slide lock notch to prevent rearward movement of slide, while an internal cam surface engages the sear to prevent forward hammer movement when trigger is squeezed. This safety device can be applied only when the slide is fully forward and hammer is fully cocked. 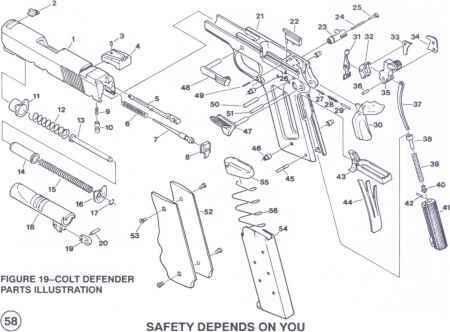 To apply Slide Lock Safety, point pistol in safe direction, keep fingers outside trigger guard, pull slide fully to rear and allow it to return sharply forward, leaving the hammer in fully cocked position. Press up on Slide Lock Safety until it fully engages slide lock notch (See Figure 2). When the Slide Lock Safety is down, the sear is free to release the hammer to fire the pistol when it is properly gripped and the trigger is squeezed. The Grip Safety is located on the upper rear part of the receiver (See Figure 1). The Grip Safety is automatically applied by spring action to prevent rearward travel of trigger unless pistol grip is firmly and properly grasped. The front of the Grip Safety (inside the pistol frame) contacts rear of trigger to prevent its rearward movement. When the pistol grip is positively grasped, the Grip Safety is rotated out of contact with rear of trigger to allow trigger movement.